Duram, NC-The Institute for Genome Sciences and Policy at Duke University recently installed a digital signage system driven by three MagicBox Aavelin AV 400 units, with Sampo LME42X8 LCD displays employed as well. The Institute has labs and offices in four locations on campus, and one of the primary goals in implementing this system was to connect people across the institute. Besides unifying the community, the systems are used to advertise various seminars and reiterate the mission of the institute. 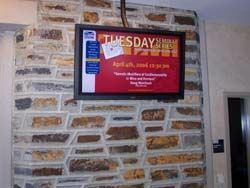 Duke University's Institute for Genome Sciences has unified its separate campus locations by installing several MagicBox Aavelin digital signage systems, which advertise seminars and display various school messages.